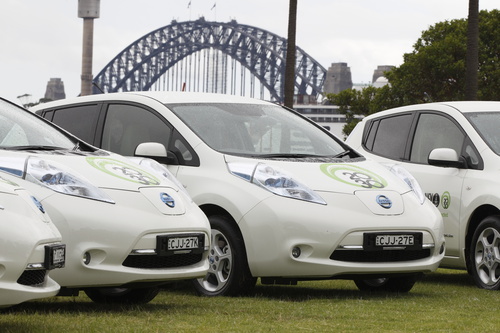 Nissan wins a coup over Toyota as Sydney's city government replaces a fleet of Prius's with 10 Nissan Leafs for use by city employees in duties around town. Sydney Australia is replacing a fleet of Toyota Prius's with 10 Nissan Leaf's in the largest Leaf order to date in Australia. The electric cars will be used by a range of City employees, including building and health inspectors, town planners and engineers. The Nissan Leaf delivery was made by William F. Peffer Jr., Managing Director and CEO of Nissan Australia to City of Sydney Lord Mayor Clover Moore. Speaking at the ceremony, Peffer said "They represent the first mass-produced, zero tail-pipe-emissions vehicles on the planet. We are the number one provider of that. Really, there is no emission from this vehicle as it is going down the road." Sydney was the first city in Australia to achieve formal certification as carbon-neutral under the National Carbon Offset Standard in November 2011. To support the electric car deployment, the City has installed seven electric charging stations at its public parking stations in Kings Cross and Goulburn Street. Additionally Sydney is installing 5,500 solar panels on 30 of its buildings, including Town Hall House, public buildings, major depots and additional solar panels for electric vehicle charging offsets, the largest building-mounted solar installation in Australia. Part of the electricity produced by these solar panels will offset the electricity consumed by the fleet of Nissan Leaf electric cars. In addition to the Prius's being replaced by these Nissan Leaf's, Sydney has had previous experience with electric cars. The city was one of the 30 founding customers for Mitsubishi’s i-MiEV when it arrived in Australia in 2010. The logo painted on the cars is for Sydney 2030, which is a process the city is undergoing that is "about changing the way we live, work and play in the city; now and into the future." "The other thing I hope it will do is to set an example to tiers of government, I'd like to see the federal government fleet in Canberra, I'd like to see the state government fleet in Macquarie Street using sustainable vehicles," said Moore.